Blue Pikmin powered-up by an ultra-spicy spray. Ultra-spicy spray is a red-colored spray that can be obtained by gathering ten ultra-spicy berries from a Burgeoning Spiderwort plant, or finding a concentrated dose. When used, any Pikmin in the party will become more efficient at their tasks, and in Pikmin 3, bloomed into the flower stage as well. By pressing / in Pikmin 2, or / / (or by tapping the "Spray" button on the GamePad) in Pikmin 3, any Pikmin following the current leader's party, regardless of distance, will be powered up; Pikmin not in the party will not be affected. In Pikmin 2, their leaf, bud, or flower will be replaced with a pink flashing light, similar to the one over Olimar's head. In Pikmin 3, they will be instantly upgraded from a leaf or bud into a flower. Aesthetically, the affected Pikmin's flower has an orange glow, while their body glows pink. Each Pikmin's maximum speed becomes nearly as fast as flowered White Pikmin, and the affected Pikmin receive a general increase in task speed, which affects their attack frequency, their efficiency when taking down gates, constructing bridges, and recovering from enemy attacks. This effect wears off after 40 seconds in Pikmin 2, and 30 seconds in Pikmin 3, all effects wear off. While the spray's effect can be extremely useful in many situations, caution should be observed, as drowning Pikmin sprayed with an ultra-spicy spray will actually die more quickly than unsprayed Pikmin. In Pikmin 2, burning and suffocating Pikmin will also perish sooner, but in the sequel, burning spicy Pikmin last just as long as normal ones (although their death animation runs faster than normal). Finally, because the Pikmin's running speed is slightly less than a flower White Pikmin, spraying a group of flower White Pikmin will actually make them walk slightly slower. Pikmin carrying objects have their attributes changed in a different way. In Pikmin 2, all the spray does is make the Pikmin behave as if they are flower Pikmin, meaning that spraying a group that is already all flowers is a complete waste. If the effects of the spray wear off while the Pikmin are carrying the object, they will continue carrying at the same speed as if they were powered up, until they deliver the object or drop it. This makes this exploit particularly useful when retrieving the Doomsday Apparatus. In Pikmin 3, it sets the Pikmin to the same carrying speed as a standard-type flower Pikmin, meaning that White Pikmin actually become slower carriers. In this game, the previously mentioned exploit with the timer running out mid-carrying does not exist. Technically, any Pikmin type's attack power is changed to 10 (in both games), and their attack and obstacle-clearing speed increases to around 180%. This means that Red, Purple, and Rock Pikmin experience a decrease in power, while Winged Pikmin benefit greatly from being sprayed, as well as White Pikmin in Pikmin 3. Still, the increase in speeds makes up for those power nerfs. If the spray button is pressed while there are no Pikmin in the current leader's party, nothing will happen, and no spray will be deducted from the total. If Pikmin are told to go inside an Onion, they will lose their spicy status. In both games, if the player sprays an already spicy Pikmin, the duration of the spray will be reset. 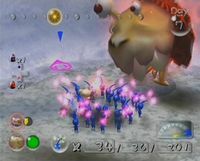 Interestingly, if the player uses an ultra-bitter spray on a spicy Pikmin, it will also reset its spicy mode duration. In Pikmin 2, the first time in a saved game the player uses a spray will trigger a cutscene, but the spray's duration counter will continue to go down during it, meaning the player will have less time to enjoy the spray with after the cutscene is over. In Pikmin 3, this has been fixed, in that the timer only starts going down when the cutscene is finished or skipped. A drop of ultra-spicy nectar in Pikmin 2. A drop of ultra-spicy nectar in Pikmin 3. The S.S. Drake analyzing a drop of ultra-spicy nectar. Several Pikmin under the effects of an ultra-spicy spray in Pikmin 3. A White Pikmin under the effects of the ultra-spicy spray, in Pikmin 2. The pause menu item for the spray and berry count in Pikmin 2. A clay model of a Purple Pikmin carrying an ultra-spicy berry. A Rock Pikmin in the ultra-spicy spray cutscene. A Yellow Pikmin after using ultra-spicy spray in Pikmin 3. A group of Blue Pikmin under the effect of the ultra-spicy spray. Dutch Ultrapittige spray Ultra-spicy spray Taken from the manual of Pikmin 3. French Spray Epicé Spicy Spray "Epicé" should be "Épicé". Spanish (NoA) Atomizador superpicante Ultra-spicy atomizer Taken from the manuals of Pikmin 2 and Pikmin 3. Portuguese Spray ultrapicante Ultra-spicy spray Taken from the manual of Pikmin 3. Russian ультраедкийаэрозоль (ul’traedkijaèrozol’) Ultra-spicy aerosol Taken from the manual of Pikmin 3. This page was last edited on February 25, 2019, at 15:00.